Real Simple has a great rebate offer. 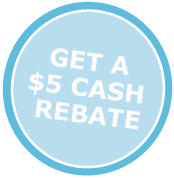 If you send in your receipt(s) confirming purchase of $15 or more on products from any of the participating brands in the promotion, you could receive a $5 cash rebate from Real Simple. Update: I am such a scatterbrain today! I completely forgot the link on how to redeem this offert! So sorry everyone — here is the link!